Start walking in comfort and choose from our selection of stylish and comfortable footwear with the function of custom-made orthotics built right in! W e provide custom made orthotics and orthotic footwear to clients living in Brampton, Georgetown, Mississauga and the surrounding area. Orthotics and footwear are available for everything from hiking, lounging and golfing to working in the office! Please view our product line and contact us if you have any questions. Get a sophisticated Gait Analysis of the way you walk, in the comfort and convenience of your workplace!For groups of 5 or more people, we can come right to your workplace to assess your feet and provide a truly computerized weight bearing, dynamic gait analysis. Please call us for details. Quality European Designed and Manufactured shoes and sandals are specially designed footwear with custom made orthotics built right in. 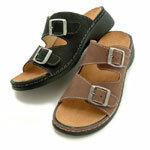 We have a wide variety of styles of both shoes and sandals which provide the ultimate in comfort and style. Yes, they can be viewed online in order for you to choose the right pair for you. Below is the complete selection available to you! These products (shoes, sandals and custom made orthotics) are available for purchase only at Queen West Physiotherapy & Acupuncture in Brampton. See Map and Directions to Queen West Physio or contact us for further information on any of these products. The Little Foot Care Book - educational, even entertaining and very easy to follow.